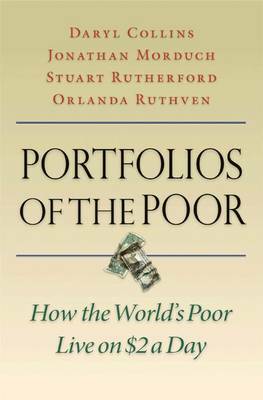 Portfolios of the Poor: How the World’s Poor Live on $2 a Day (Princeton University Press, 2009) tackles the fundamental question of how the poor make ends meet. Over 250 families in Bangladesh, India, and South Africa participated in this unprecedented study of the financial practices of the world’s poor. These households were interviewed every two weeks over the course of a year, reporting on their most minute financial transactions. This book shows that many poor people have surprisingly sophisticated financial lives, saving and borrowing with an eye to the future and creating complex “financial portfolios” of formal and informal tools. The reason research like this is so useful and even groundbreaking is that it blows the doors off the misconception that the poor live on $1-2 a day, everything. The reality is that they live on $5 on Monday, and $0 until Friday. The implications for these findings are huge because it shows researchers and practitioners what poor people need. In the past, much of aid and development has focused on what people think poor people need. With the insights from books like Portfolios of the Poor, economic development strategies can be targeted to make the biggest difference. [Portfolios of the Poor] emphasizes that being poor in a poor country means having an income that is not just low but variable and unpredictable. At least as much as a family’s average level of income (such as $2/person/day), the volatility around the average drives how the poor manage money. If you make $1 today, $4 tomorrow, and nothing the day after, but need to put food on the table every day, you will engage in complex patterns of borrowing and saving to smooth the mismatch between your income and outflows. Thus out of necessity poor people deploy more complex financial strategies than do the rich. The book tells stories of families who are constantly juggling small loans to and from friends and family; saving with local “moneyguards”; participating in savings and insurance clubs (such as burial clubs in South Africa); buying groceries from the local shopkeeper on credit; and otherwise patching together an extraordinary diversity of financial devices in order to get by. I love how shamelessly arrogant we are. We should probably just bombard them with foreign aid and thereby disrupt these fragile economies and create trophies to chop each others’s arms off over.